Image caption Iranian leader Ayatollah Ali Khamenei called Saudi leaders "blasphemous" and "faithless"
Iran's supreme leader has launched a blistering attack on Saudi Arabia, urging Muslims to "reconsider" its custodianship of Islam's holiest sites. Ayatollah Ali Khamenei accused the Saudi authorities of "murdering" pilgrims who were caught up in a deadly stampede during last year's Hajj. The injured were locked in containers and not provided medical treatment, he alleged, without providing evidence. The stampede killed 2,426 people, according to an unofficial tally. The Saudi authorities, who say only 769 died, have made few details of the official investigation into the incident public but have previously rejected criticism of their management of the Hajj. 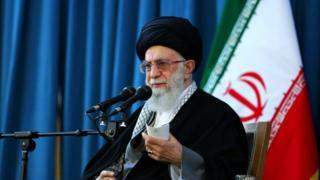 In a statement published on his website marking the anniversary of the stampede, Ayatollah Khamenei accused the Saudis of being "at fault". "The heartless and murderous Saudis locked up the injured with the dead in containers - instead of providing medical treatment and helping them or at least quenching their thirst. They murdered them," he said. "Instead of apology and remorse and judicial prosecution of those who were directly at fault in that horrifying event, Saudi rulers- with utmost shamelessness and insolence - refused to allow the formation of an international Islamic fact-finding committee." The ayatollah called on the Islamic world to "fundamentally reconsider the management of the Two Holy Places" - Mecca's Great Mosque and the Prophet's Mosque in Medina - and "the issue of Hajj". "Those who have reduced Hajj to a religious-tourist trip and have hidden their enmity and malevolence towards the faithful and revolutionary people of Iran under the name of 'politicising hajj', are themselves small and puny satans who tremble for fear of jeopardising the interests of the Great Satan, the US," he added. In May, Iran's Hajj organisation declared that pilgrims from the country would not be able to attend this year's Hajj, blaming "ongoing sabotage by the Saudi government". The Saudi foreign minister responded by accusing Iran of asking for special treatment for its citizens and of finding excuses for denying them the chance to fulfil a religious duty. The decision came four months after Saudi Arabia severed diplomatic ties with Iran in response to attacks on Saudi diplomatic compounds in Iran by people angered by the kingdom's execution of a prominent Shia cleric convicted of terrorism offences.